UPDATE: Congratulations to giveaway winner Linda K.! Read, White & Blue Summer Giveaway! Beautiful quilted Vera Bradley case in cool cobalt and white to hold your favorite digital reading device. 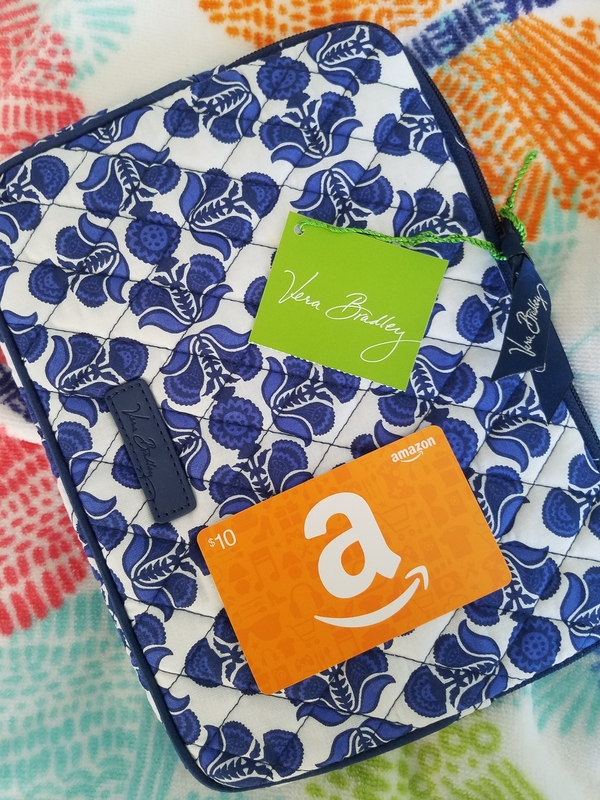 Amazon gift card to help you stock up on summer reads. Entering is easy and fun. Just answer the following question in the comments below, and remember: there is no wrong answer! Contest runs through Friday, July 21, 2017. Winner will be chosen at random and notified by e-mail. Entrants from lower 48 U.S. states only (because shipping). Good Luck and thanks for playing. I can’t wait to hear what answers you come up with! As you can see, this funny, tender read about second chances and family life is sporting a beautiful new cover to match the sweet story within. Mother’s Day is the perfect opportunity to show it off, so I’m giving away a print copy to each of three lucky winners. If you do win, however, you don’t have to give it to Mom:) You can keep the book for yourself. I promise I won’t tell! Just drop in your details below and choose an option to enter. It’s a random drawing. There’s no purchase necessary, but you can earn multiple entries from sharing and commenting. Contest runs from May 8-15, so don’t delay, enter right now! Winners will be chosen Tuesday, May 16. Due to shipping costs, this contest is limited to entrants within the 48 contiguous United States.